I couldn’t go to Maker Faire this weekend because I was at Space Camp. I’ve wanted to go since I was a kid, and they have adult programs so I finally got my act together and went. My friend Srini came too. Because the description on the site was so vague, I was worried that it would be too “kiddie”, but it wasn’t, it was awesome! I guess the kiddiest thing we did was build model rockets, but that was fun! Space Camp has a full-size shuttle simulator and a mission control. We did 3 missions over the course of the weekend, and people rotated between Mission Control, Orbiter Crew (Commander/Pilot), and Mission Specialist (EVA). I got to do EVA on the first mission, which is exactly what I wanted. I was on the Canadarm and Srini was in a harness simulating free EVA. We had to lower a satellite into the cargo bay, repair it as mission control instructed us, replace some antennae, reactivate it, and release it. It was so much fun! For the next mission I was Flight Director, which was kind of boring until things started going wrong. Then I had to find the solutions and communicate them to CAPCOM, who relayed to the orbiter crew. Still, it was interesting to see how Mission Control works. For the final mission, I was the Commander on the shuttle and Srini was the Pilot. (Apparently astronauts don’t like to be called “co-pilot”, so the pilot is the “commander”, and the co-pilot is the “pilot”). We had lots of checklists to run through and many switches were flipped. I brought the shuttle in for a smooth landing at Kennedy. 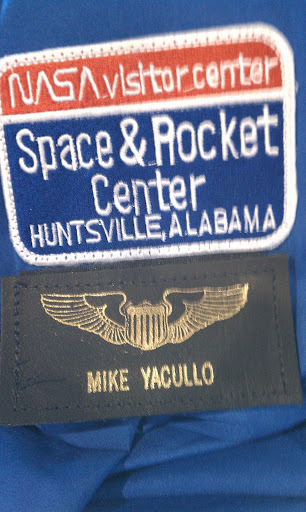 Beside the missions, we visited the museum, rocket park, launched our rockets, and designed a mission patch. We went on the multi-axis trainer and the centrifuge. A nice bonus was that we had access to the museum during off-hours, so we could get right up to all the exhibits. The whole experience was great. If you like space and rockets at all, you should consider going. There are also kid/parent camps (and of course straight-up kid space camp). The one thing I would suggest for adults staying at the Marriott across the street instead of in the dorm, which is pretty grody from generations of kids staying there. To complement the posting of Lego 1986 Keith Hernandez, here is a 2009 Keith Hernandez minifig. He has a custom face decal (note reading glasses) and a tiny handpainted American flag pin. As usual, full-size pictures in my flickr set. I’ve been working on this one for a while and it’s finally done: Lego Keith Hernandez 1986. 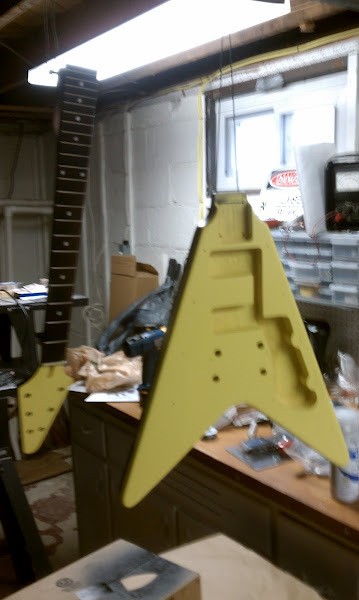 This was my first face decal. Thank you everyone who reviewed the variations. I also did decals for the stripes. I had a hard time getting the colors of the stripes right (because of the color of the plastic underneath) but other than that I’m pretty happy with it. Helmet emblem, belt, socks, and shoes are hand-painted. 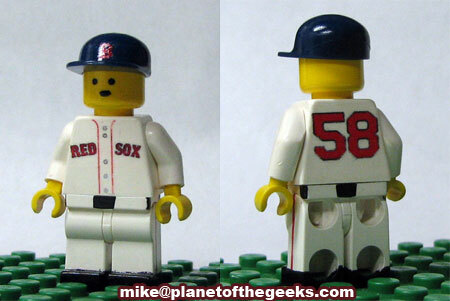 A big thanks to Red Sox Monster for posting about my Lego creations, as well as Home Run Derby, Yahoo Sports, Deadspin, MetsBlog, and all the others who picked up the story. 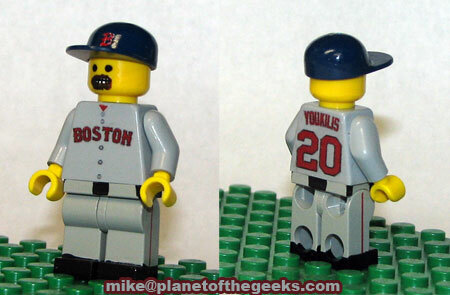 Side note: apparently Kevin Youkilis is a Lego fan (or at least his stepson is). I’ll trade him a custom for an autographed something! Kathy is from Maine and she and her mom are Red Sox fans. Her mom requested a Jonathan Papelbon, so here he is. I tried to capture his weird facial expression but it didn’t come out so good. While I was at it I did Kevin Youkilis too. I think his trademark grimace came out pretty good. I gave him a black eye but got rid of it, it made him look like a zombie or something. 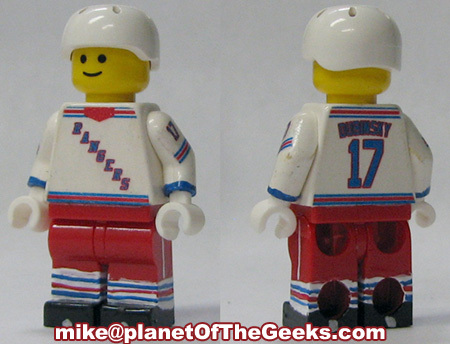 Here’s Brandon Dubinsky of the Rangers. This was a tough one because the Rangers’ uniforms are so intricate and stripey. Eventually I decided to just try to capture the feeling of it rather than reproduce it exactly. I think it came out ok. The socks are sort of sloppy but by that time I was mentally done working on it. I’m in Las Vegas for a conference, so last night I headed over to Flyaway Indoor Skydiving. It was really fun, and you should check it out if you’re in Vegas. You watch a training video, go over safety and hand signals, get your equipment, and then go into the wind tunnel. Here’s a video of my session (no audio). 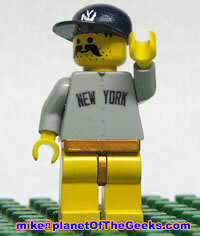 Ever since I made Lego David Wright, people have been saying “Make some Yankees!”. Here is Lego Giambi, complete with slump-breaking moustache and thong. The clouds finally lifted, and last week I got the check out my new NexStar. After setting up the red dot finder, I was ready to go. Having already entered my latitude and longitude info into the scope’s computer during one of the cloudy nights, alignment was very easy. From my backyard I could see the moon, Saturn, and Mars in the sky, so I decided to try using the Solar System Align. I got the moon centered in the scope, hit the button, and the scope immediately began to track. I still love my dobsonian, but it’s so great to let the scope do the tracking instead of having to nudge the scope every few seconds. I think it’s really going to help with photography. Next I hit the button for the scope to slew to Saturn, and there it was, right in the center. Then I told it to go to Mars, and the result was the same. Very satisfying. Although I do hope to learn the constellations better, the GoTo functionality is going to be great for short sessions where you want to see something quick. So far so good. I hope to post some moon or Saturn pictures in the next couple weeks.